Our home for waifs and strays sits comfortably in a small but perfectly formed village in Gower. This is an area of outstanding natural beauty and offers the visitor more than breathtaking views. 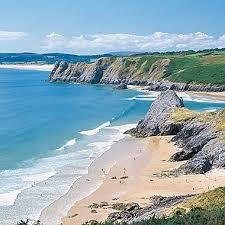 From sandy beaches to hidden coves, from wild moors to green valleys, our Gower home has it all. There are castles and caves to explore and King Arthur’s Stone stands on the Bryn, where it landed all those years ago! Well, supposedly so! Therefore, it is no wonder that I never run short of things to write about. I travelled the world over and lived many lives in search of a place where I thought I would settle. I fished the Pacific Ocean and bartered with the Indians, but I was young and life was different then. To sail in seas where the great Orcas swam along side of us, was one of my greatest (wild living) memories. Although these social animals are referred to as ‘killer whales’ they are not really a threat to humans. Only when they’ve been captured and placed in themed parks do you hear of them killing or harming anyone. And as many of you know, the Adirondack Mountains, Up State New York, is where I almost lost my heart, but always, always, Wales called me back home to the place where I was born and raised to be a free spirit. Do I regret it? No, I don’t! For me, there is nowhere I would rather be than here in our home for waifs and strays, with my kind and unassuming husband, in Gower!